The content delivery veteran plunged on weak next-quarter guidance as large media customers continue to lean on their own in-house solutions. Is the business model falling apart, or should you buy Akamai at today's deep discount? 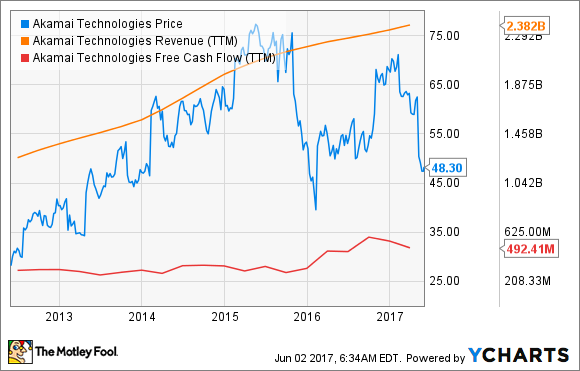 Shares of Akamai Technologies (NASDAQ:AKAM) fell 22.6% in May 2017, according to data from S&P Global Market Intelligence. The bulk of Akamai's pain last month followed immediately after the company's first-quarter earnings report. The content delivery network operator exceeded Wall Street's estimates with earnings of $0.69 per share on sales of $609 million, but guidance targets for the second quarter stopped short of analyst consensus for that period. Share prices plunged more than 15% the next day. Akamai's media delivery sales are slowing down in the second quarter and CEO Jim Benson expects that negative trend to continue in the second half of 2017. Many of the company's largest media customers are rolling their own content delivery solutions these days, and Akamai faces pricing pressure from smaller rival Limelight Networks (NASDAQ:LLNW) which is willing to sacrifice profit margins in order to pick up some revenue growth. So Akamai's close shave -- share prices have fallen 28% so far in 2017 -- makes sense on its face. At the same time, the company is picking up steam in the data security sector and the media market softness could very well be temporary. Benson noted that the sales growth headwind from a few large customers developing in-house content delivery solutions should abate when those large accounts shrink far enough to stop moving the needle. At that point, Akamai snaps back to higher growth rates albeit from a smaller base. And while all of this is going on, Akamai is producing some of the richest cash flows in its history. Opportunistic investors would be wise to pick up some Akamai shares while prices are low and the business quality shows strong signs of lasting improvement.